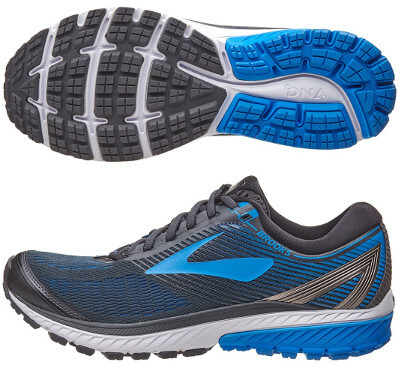 Brooks Ghost 10 are neutral cushioned running shoes. The Brooks Ghost 10 reaches the market well positioned in USA and with interesting features to gain market share in the european one where well established running shoes like Saucony Ride 10, Adidas Supernova Glide 9 or Asics Gel Cumulus 19 are really popular. In addition to marketing efforts, maybe is time for the american brand to drop the price and increase its visibility. There is also available a Gore-Tex® (GTX) edition for enhanced protection under more complicated weather conditions. While keeping the great double layer "Air Mesh" upper, it is simpler than in its predecessor Ghost 9 with bigger holes to promote ventilation and "3D Fit Print" fused overlays to create structure for snug fit. Gusseted tongue features extra comfort without folds and prevent dust and debris from jumping inside. Well padded and extremely comfortable interior and collar lining remind its bigger sibling the premium (and costly) Glycerin 15. One interesting change in Ghost 10's midsole is the new crash pad for improved shock absorption, something that would appreciate better heel strikers. In the same way of its counterpart with pronation support Adrenaline GTS 17, cushioning relies on realiable BioMoGo DNA foam with slightly soft feeling. Outsole configuration remains pretty similar with deeper and wider transversal grooves in forefoot to increase flexibility and therefore promote smoother ride. As usual, more robust rubber (HPR+) is used in more exposed areas to increase durability.